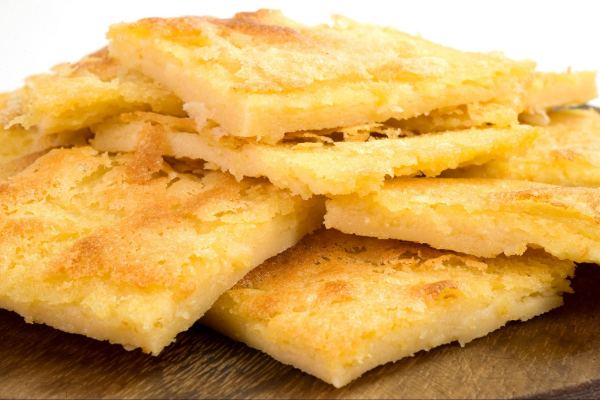 It appears that farinata had its origins in accidental discovery by Genoese sailors after Genoa defeated Pisa in the Battle of Meloria in 1284. The story goes, that, on their return journey, a thunderstorm caught the Genoese fleet at sea. The ships’ provisions of oil and chickpea flour were consequently overturned and soaked with salt water. The sailors’ supplies were limited and they had to sustain themselves by eating bowls of salty chickpea paste. Some refused to eat this paste and left their bowls out on the deck exposed to the sun. To their surprise, the batter had turned into a much more appealing focaccia bread, thanks to the heat of the sun. The sailors found the sun-baked mixture to be more palatable and once they were back on dry land, they perfected the batter and baked it in an oven. They called this oven-baked pancake l’oro di Pisa (Pisan gold) in mockery of the defeated Pisans. 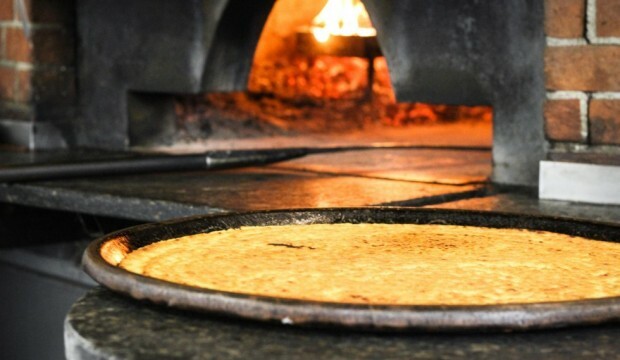 Tradition wants us to prepare farinata by stirring chickpea flour into a mixture of water and olive oil to form a loose batter, and bake it in the wood-fired oven on a copper baking pan. Farinata may be seasoned with fresh rosemary, pepper and sea salt and is served by cutting it into irregularly shaped triangular slices, and eaten (with no toppings) on small plates with optional black pepper. I chose to shake things up a but and take this age-old recipe from snack cred to a complete meal that simply bursts with flavor. 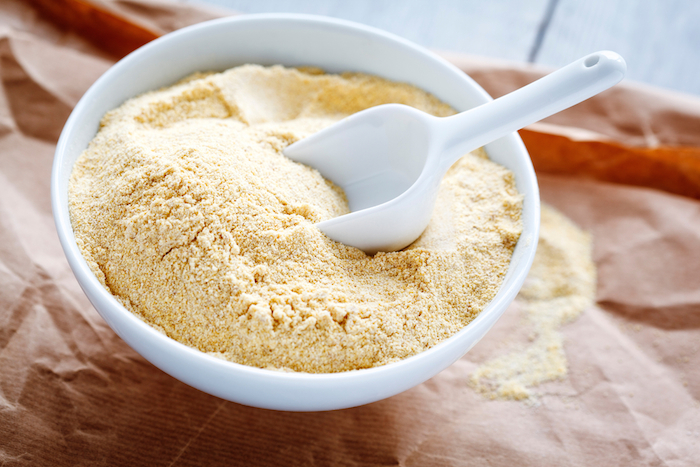 If you haven’t used chickpea flour before let me tell you, it’s everything that it’s ground-up to be! 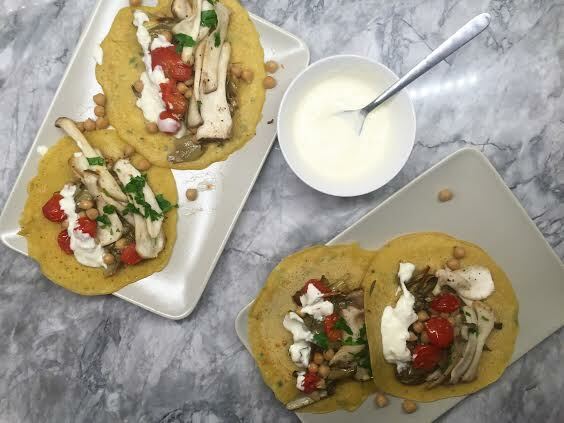 Thanks to the use of whole chickpeas, chickpea flour is gluten-free and packed with protein, iron and fiber so not only does it taste great, but it’s good for you. 2. Prepare Farinata Batter: In a mixing bolw, combine water with the oil, salt, pepper, and chickpea flour. Blend until smooth. Add more flour, if necessary, until the mixture is the consistency of pancake batter. Lastly add the fresh rosemary and set aside. 3. Prepare the Aioli: With a mortar and pestle mash the garlic cloves and salt until they form a paste. 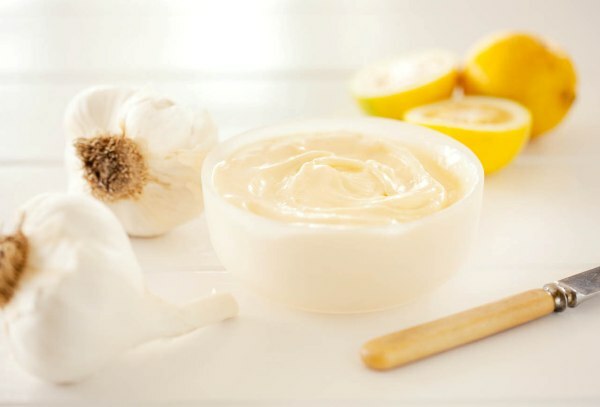 In a small bowl add the mayonnaise, garlic paste, lemon juice and freshly cracked black pepper. Mix to combine. Cover and refrigerate at 30 minutes or until ready to use. 4. Prepare Roasted Baby Artichokes: Preheat oven to 400 degrees F. Remove the tough outer leaves of the artichokes and trim the stems. Cut off the top third of the head to remove the tough ends of the leaves, then cut the artichoke down the middle. Rub with lemon as you work so they don’t turn brown. 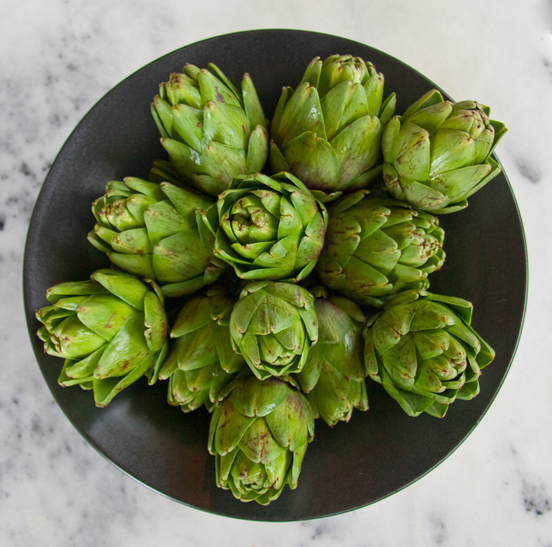 Lay the artichoke halves cut-side up in a roasting dish, drizzle with olive oil and season with salt and pepper. Roast in the oven until the artichokes are tender, about 20 minutes. 6. 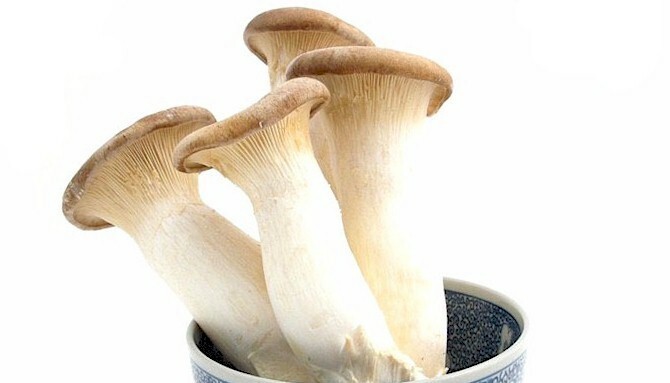 Prepare Mushrooms: Place a large sauté pan over medium heat. Melt the olive oil or butter. Add the garlic and onion and sauté until translucent. Add the mushrooms and sauté until they have released their liquid and the pan is almost dry, about 4 minutes. Remove from heat. 7. Prepare Farinata: Place a crêpe pan or griddle over medium heat and add enough olive oil or butter to lightly coat the bottom. Ladle about 3⁄4 cup of the Farinata Batter into the center of the pan. Tilt the pan to spread the batter into a thin circle. The crêpe should be thinner than a pancake in order to be able to fold it later. Cook until golden on the bottom, about 3 to 4 minutes, then flip it over and brown the other side. Set aside on a plate and cover to keep warm while you cook the remaining crêpes, using the rest of the batter. Remember when making crêpes, it’s very common for the first one or two to not turn out so well while the pan is heating to the right temperature. 8. 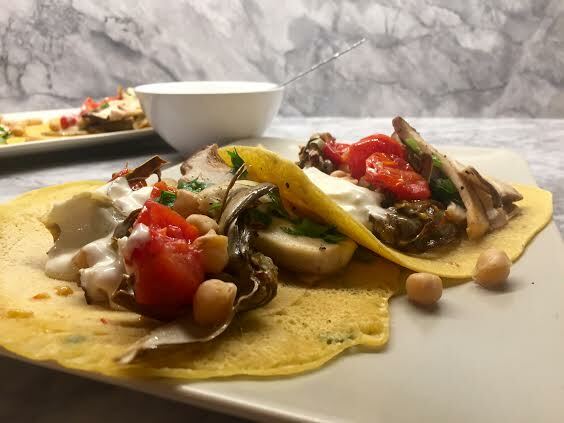 Serve: Cover half of each crêpe with a heaping spoonful of the Mushrooms and Roasted Artichokes, drizzle with 2 tablespoons of the Aioli, and then fold it closed. 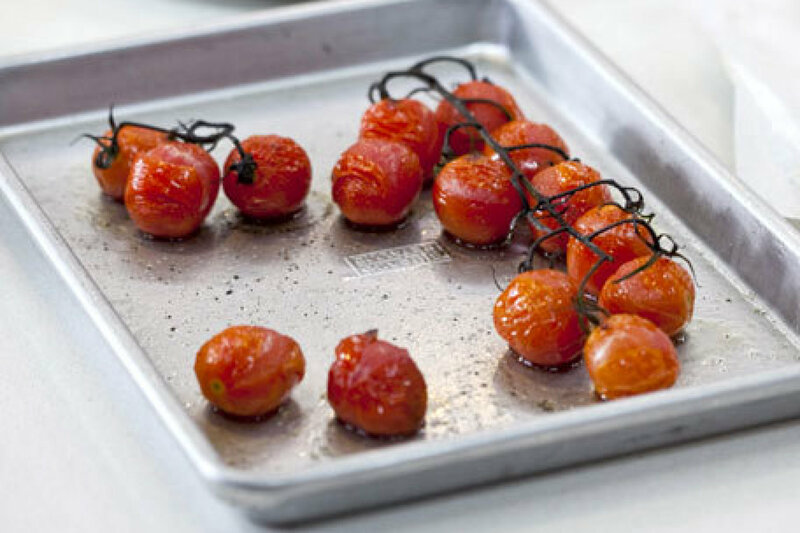 Garnish with a dollop of Aioli, some Roasted Tomatoes, and freshly ground black pepper. Serve immediately. PS in the photographs you may notice whole chickpeas, I had these leftover from a pasta e ceci that I had made the previous day and added them in to the mix! Posted on November 2, 2015 October 27, 2016 by Table Without BordersPosted in Main Dishes, RecipesTagged aioli, artichoke, bread, ceci, chickpea flour, chickpeas, cooking, culinary accident, eatbeans, farina di ceci, farinata, Genoa, Genoese, Gluten-Free, healthy eats, Italy, IYP2016, king oyster mushroom, love pulses, Pisa, recipe, roasted tomatoes, Tradition, wood-fired.